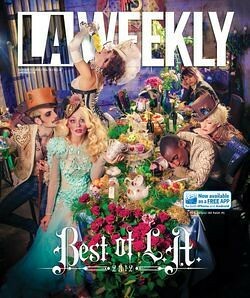 L.A. Weekly Names The Great Los Angeles Walk As One of It's Best of LA Picks! The L.A. Weekly's annual Best of L.A. issue comes with a special treat this year: Our very own Great Los Angeles Walk is among this year's picks. Held on the Saturday before Thanksgiving, Schneider's yearly excursions familiarize locals with urban beauty and obscure landmarks such as Ray Charles' recording studio, encouraging ambulatory exercise in a notoriously car-heavy city. This year, Schneider says, "Our downtown-to-the ocean walk this year (Nov. 17) will spotlight Melrose," starting at 9 a.m. on the front steps of Walt Disney Concert Hall. He tweets his location every mile or so to keep the group together, charges no entry fee and solicits advice from L.A. experts like former L.A. Weekly food writer Jonathan Gold and L.A. Observed's Kevin Roderick. What better way to prepare yourself for a month of holiday bingeing?